Having two boys less than 2 years a part has made life crazy. Crazy in a fantastic way! In some ways it is fantastic because just as one is growing out of a size, the younger one is growing in to that size. It's a dream scenario for hand me downs! But it is an absolute nightmare for laundry sorting! Sometimes the boys will share shirts, but let's be honest - there are some things not to be shared! I've come up with a great strategy that we have stuck with for years and it has made laundry sorting for the boys much easier. There are two very well known boys under wear brands... Hanes and Fruit of the Loom. For years we have purchased each of the boys underwear from one brand exclusively. It makes it super easy for the boys to find their own clothes from the clean laundry stacks. We do the same with the boys socks. We always purchase the grey tipped socks for one of the boys and the other has no grey tips (solid white) socks. What other strategies do you use to make laundry easier? What do you find in the laundry? Fish eyes and crab claws? 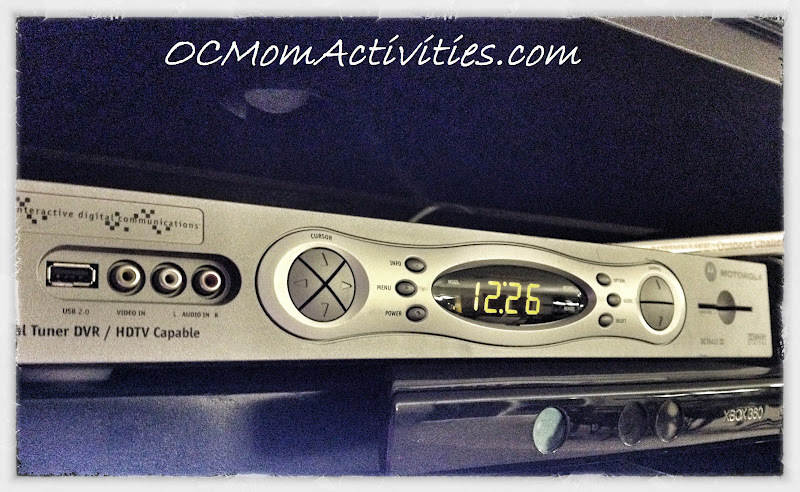 As a mom of two energetic and adventure seeking two young boys, I find a ton of bizarre things in the laundry. A lot. And I'm not talking about a Lego here and there. Just a couple weeks ago I found these crazy jelly balls. Hundreds of them in the washing machine and throughout all the clothes in the washing machine. I mean in pockets, in crevices, all over the place. I took me forever to figure out what they were and where they came from. Turns out they were a gift one of the boys had received at a party, called fish eyes. Just add water and watch them grow. Yeah... pretty sure they didn't mean to place in pockets and put through the wash to grow them. I'm just so thankful I found them before they went in the dryer because I'd bet they would be melted fish eyes... Let's just not go there. Then there was the one time I found a pair of crab claws in the laundry. Yeah... It was a couple nights after we had eaten at Joe's Crab Shack. (You can read about those fun times here.) I can rest assured that life will never be boring when I'm doing the laundry around here! Recently I got the chance to test out Wisk Deep Clean laundry detergent and in the process learned some fascinating and absolutely grotesque things about the average American's laundry. Did you know that the average wash contains 20 times more body oils and sweat than visible stains? That's just nasty. How often do you change your bed sheets? I bet not once a week like is recommended... Did you know that women are more likely to snag something out of the laundry basket to re-wear something than men? That surprised me! I'm sure you're feeling as self conscious as I am by this point, so head out and grab a bottle of Wisk Deep Clean the next time you are at the store. I've just made the switch and have absolutely noticed a huge change in the cleanliness of the laundry. I've tested it with some of our sweatiest work out clothes (and trust me, we have been putting our washing machine to the test this Summer with all of the adventures we have been on!). There are some great options including ones for families with skin sensitivities and for people with HE washing machines! I tested out the Wisk Deep Clean Free & Pure for HE machines because of the crazy skin issues we have. I dare you to test it out on a few loads of laundry to see if you notice a difference like I did! Psst... if you join their Facebook fan page here you can download a coupon too! Note: No compensation was received for this post. Product was received to facilitate the review, but as always the opinions are 100% my own! Are you as diligent about having your kids wear sunglasses as you are about sunscreen? I bet not. I know I haven't been and feel awful about it. In a recent study, it was found that 73% of parents wear sunglasses on a consistent basis, but only about 58% have their children wear sunglasses. I've sadly been in that slacker parent category. Sure we have sunglasses for the kids, but I just hadn't been diligent about having the kids wear them. It feels like the kids have grown up virtually overnight and I missed that stage where you need to transition them in to wearing sunglasses. We can't be perfect parents, right? Well, thankfully it isn't too late and certainly not an expensive fix. I headed down to our local sports store and had the boys each pick out a cool new pair of sunglasses. I used my veto powers (you know that magical I hold all the cards - charge cards that is power), to ensure that both the boys picked out sunglasses with 100% UV protection and polarized lenses. Polarized lenses are by far the best to protect your eyes, although 100% UV is far better than no sunglasses! I was absolutely thrilled at the selection of cool sunglasses, great prices (both boys picked ones that were $12.99). They look like grown up sunglasses and aren't the character ones (we've really been working on getting past the character stages). I had both of them test out the sunglasses, look in the mirror and got their approval as well as mine. We were done in about 5 minutes and everyone is thrilled! Honestly I was worried going out to look for sunglasses, worried that good ones would cost a fortune (like they do for adults many times), but was pleasantly surprised to find great ones at great prices at a reputable store. Buying sunglasses at a reputable store is so important because many times when you buy them off a street vendor, they may say they have 100% UV protection, but they actually don't because they aren't accountable to anyone. First comment coming out of the store in his new glasses, my older one commented that the world just looks more 3-D with his polarized lenses. So why the sudden interest in vision care? I recently had the chance to sit in on discussion on vision care. I learned so many valuable things about how an ounce of prevention can prevent so many vision issues down the line. What got to me the most is that even small amounts of unprotected exposure to the sun starts to quietly damage the young eyes and many times only shows up in adulthood. I've personally taken my excellent vision for granted for so many years, but I've always been personally diligent about wearing sunglasses simply because the bright sun bothers my eyes. You can find great information about sunglasses for kids and other valuable info here. Are you good about having your kids wear sunglasses? I'd love to hear either way! Note: This is part of a compensated campaign with the Motherhood, but all opinions are as always 100% my own. If you're all about desserts like me you'll be thrilled to hear that Renuzit has come out with a sinfully delicious new line of scents, sure to make your mouth water and inspire the inner pastry chef in you. The fragrance is as absolutely sinful as you can imagine, so of course I jumped at the chance to create a dessert inspired by them! You can follow along on my shopping trip here through Google+. We are huge dessert fans in our house and I'm all about cupcakes these days, so I got to work on creating a fun, delicious and tempting indulgence. Pre-heat oven to 325. Prep cupcake liners in cupcake tins. Mix dry ingredients in a bowl. In a separate bowl, mix all the wet ingredients (except for the coffee). Add slowly the wet mixture to the dry ingredients. Once mix thoroughly, add the coffee. It will be very liquidy. Don't worry! Add about 1/4 cup of the mixture to each cupcake tin. Bake in oven for approximately 25 minutes. You will know they are done once a tooth pick comes out dry. Once they are cooled, core out a hole in the middle of each cupcake. You can gently do this with a knife or use a fancy coring tool, either works the same. Add a spoonful of the cherry preserves to each cored out cupcake. Mix all the above ingredients (except the cherry preserves) on high in mixer until it gets a fluffy consistency (it takes a few minutes to get to this point). Once it is fluffy, gently mix in the cherry preserves. You don't want to mix to much at this point because it looks great when it is barely mixed in. Load in to pastry bag with a wide pastry tip. Top each cupcake. Set the topped cupcakes in the freezer or fridge while you prep the chocolate drizzle. Place the chocolate chips in a microwave safe bowl and microwave in 30 second increments. Check and mix. Repeat until smooth, it will take about a minute and a half. Mix in the crisco. Drizzle the mixture on the cupcakes and top with a maraschino cherry. To find out more about the new line of air fresheners you can go to their website here or to the Renuzit Facebook page here. It seems like there are so many people going through tough times right now, with the economy, the incidents in Colorado and countless other personal strifes. So many people I know are dealing with so much stress. A bouquet of roses I picked from my garden the other day to puts a smile on my face because somehow flowers always make everything better, even if just for a minute! Hopefully it will for you too! I've been working hard at decreasing stress in my life because it was starting to take a toll on my health (physically and mentally). It hasn't been easy but it has been a conscious decision each and every day to eliminate things that are of a negative influence or stress. Of course there are always things in our daily lives that we can't remove, but changing the things I can is leaving me a much happier person! What makes you smile when times are tough? For me it is fresh flowers, coffee, yoga and when I have time - it's hitting the gym. But nothing is better than experiencing those little magic moments with my kids. 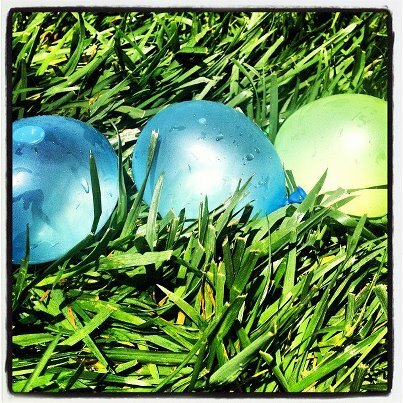 Checking off one more thing off our Kids Summer Bucket List... Water balloon fight! 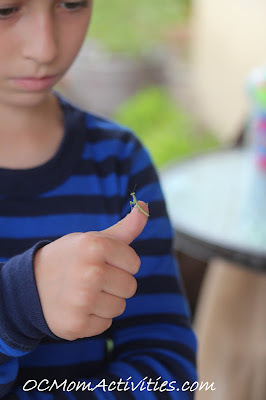 For a simple one dollar purchase at the dollar store, it provides hours of fun in our own back yard! How are you going to tell your children about today's events in Colorado? I'm finding myself at a loss for words. My boys are old enough that they need to be told about the events in Aurora, Colorado early this morning. If I'm not the one to tell them, they will surely hear about it shortly from one of their friends and I'm not okay with that. I want to be sure they gain the information needed to base any fears, sadness or other emotions associated with this tragedy. Memories of 9/11, Columbine and many of the other tragic events are filling my mind. Wonder of what has come of this world and how much it has changed since I was a child. What concerns me most is the fear of the copy cat incidents like the ones that occurred after Columbine. Will today's incident affect my movie going, absolutely, I can't deny that. But do I want it to also be present in the minds of my young boys as they go to movies this Summer, no. That's not fair to them. I feel like it's our job as parents to shelter children enough to allow them to live a happy childhood, yet teach them enough, early enough so they can make smart decisions. Do we not discuss it with them, and hope they don't hear about it from friends? It is Summer break and they aren't in school every day. I have mixed emotions because I know it is probably inevitable they will hear about it and I'd reather deal with it head on. Did horrible tragedies happen when we were all children? Absolutely, but the difference that has occurred is the broadcast media. Now we all hear about all of these incidents on a world wide level instead of regionally or only if it happened in your city. Our children are growing up learning more about the harshness the world has to offer, but will it make them stronger or weaker? Have you discussed the incidents today with your children? Join in on the OCMomActivities Facebok page. I'm really struggling with how to broach this with my children and I would love ideas and other thoughts on this. Last week I had the chance to co-host a fabulous evening at the brand new Hanna Andersson store at the Shops at Mission Viejo. I had no idea I would fall in love with the brand! I wasn't too familiar with the Hanna Andersson brand but knew by the reactions of my friends that this was a brand I had been missing out on! While at the event I had the chance to speak with the wonderful manager as well as many of the Hanna Andersson executives, truly wonderful people! The manager explained that when she noticed that every other customer was buying at least one of the pajamas - that there was something to them. They are just that fabulous. I had to see for myself so I bought a pair for my son and they are so soft & cozy. I can see why everyone loves them and my son doesn't want to take them off! And well, he looks so darn cute in them, I want to go back and buy him a pair in every pattern! The quality is impeccable, so I don't mind paying a bit more than I normally would for clothes. My youngest son is one to absolutely destroy clothes - so if I have to pay a bit more for clothes and actually have them last more than a few wearings, well I am sold! Many of the Hanna Andersson clothes are made with eco-friendly fabrics, including eco-friendly cotton. The quality of the garments is apparent from first touch. They pride themselves on durability. If you aren't familiar with the Hanna Andersson brand you can head to their website here. They have a great selection of clothes for babies to 12 year olds in the store (adult sizes are on the website). I absolutely loved the selection of adorable lunch totes, water bottles and thermal containers for kids lunches. I always love perusing the baby clothes (even though my boys have long out grown those sizes). It brings back so many memories of when my boys were babies. These sleep sacks and layettes are an absolute must for all new babies! My boys lived in them the first few weeks. If you don't have little ones, be sure to stop by to find the perfect gift for a new baby. The mom will be so appreciative! Run, don't walk down to the new Hanna Andersson store at the Shops at Mission VIejo! Do you have any Hanna Andersson pieces? What's your favorite and why? Love this photo I snapped during a recent visit to the San Diego Zoo Safari Park! Today was one of those moments when I was taken aback by how much my son has grown up and proud of him for his powers of perception. He came running in to the room and said, "Hey Mom! Guess what? The burritos we got from fresh&easy say they are called love burritos!" It took me a minute as I tried to figure out exactly what he meant. My confusion must have been apparent because he then said, "Hang on, I'll show you, meet me in the bathroom." Yeah, I know. But I was catching on. He grabbed the frozen burrito package and met me in the bathroom to show me the above picture. Seriously so cool and I'm sure totally planned by fresh&easy. Best part? He then explained they ARE right, he LOVES them! Cars Land at California Adventure has been open just a short time, but our family has quickly found our favorite location for our (almost) weekly dinners at the Disneyland Resort. It's on the outside of Flo's V8 Cafe, along the Radiator Racers track. I absolutely love a good dinner, tucked in a quiet corner, and good scenery. We've eaten there a number of times since the Cars Land opening and have enjoyed every time! The meals are a great value (same pricing as most of the cafeteria style eating restaurants at the parks) and are so delicious! You won't find a burger or pizza on the menu. What you will find is old-school diner themed to the max. With Pork Loin, Roasted Citrus Chicken Breast, NY Strip Loin or Citrus Chicken Salads, the adults are sure to find something delicious and nutritious. There are many sides to choose from that are all equally yummy and taste like they are straight from your family dinner table. You can order delicious milk shakes and other beverages (including beer and wine). The kid menu is delicious with chicken and roast beef sandwiches in addition to macaroni & cheese. And don't get me started on the gravy options... Yum is all I can say! Now what rivals the yumminess of the dinner is the ambiance that the outdoor eating terrace offers. My favorite place to sit is along the railing with a view of Radiator Springs Racers. It just can't be beat. Every time we have sat there we've had several of our favorite Cars characters cruise by. Love it! Now I've heard there are fabulous breakfast options at Flo's V8. Anyone tried them and want to guest post about it? Love to share! Now if you ever run in to us having dinner there, be sure to come say hi! We have a new addition to our family. It's name has yet to be decided, but it was found quite by luck out in the garden and much to the delight of my youngest. 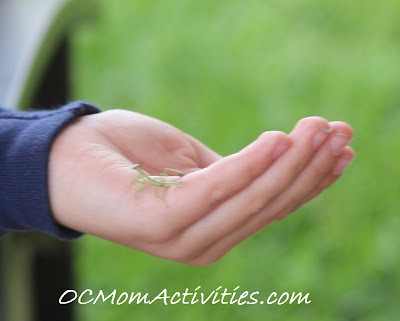 You may remember a much beloved praying mantis was laid to rest last fall. Now we have a little baby one to raise, well first we have to figure out what to feed this tiny little guy! Ideas are welcome! He's already built a bond with my son as he prefers to be held by him instead of hang out in his temporary living quarters. He escaped once tonight already and I found him in the pet water bowl in the kitchen. He was very happy to be rescued! This little one is pretty cute though, so I'm ok with the addition. We've had weather whip-lash here in Southern California this week. We had record breaking heat earlier in the week, then today the humidity set in and rain. Yes rain. It's practically unheard of to have rain in the Summer here and humidity is even more rare. So what did we do? We quickly added something to our Kids Summer Bucket List - sitting outside under the pergola listening to the rain fall around us. Sitting and listening to the rain has been one of my favorite things ever since I was a child. 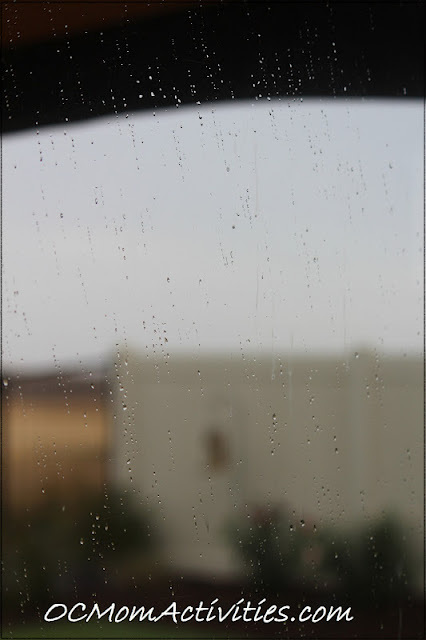 If I heard the rain I would get up and sit with my face pressed up against the window just listening. I could listen for hours. One more un-expected Summer experience can be crossed off the Kids Summer Bucket List! Ok, I admit it. I might be having a minor meltdown. Make that massive anxiety attack. We are switching cable service providers on Friday. Oh yes, we bundle like everyone else in the neighborhood. I'm very excited for a better service provider, but yesterday it hit me - all my DVR'd programs that I haven't gotten to will be lost. I need to marathon watch them all now. I've started that process but today it hit me... all those programs I love and have set to automatically record will not transfer over to the fancy new DVR. I'm a Real Housewives of every city fan. Do you realize how many that is to keep track of? I can't even remember half their names in the off season, let alone which season starts when. Ghost Adventures, House Hunters International and Deadliest Catch are all must haves in my book. I have so many random shows set to record on the DVR I'm having serious anxiety over trying to make sure I don't forget one, because you know that would surely be the one I would miss the most. If you were having a divorce with your DVR, what would you miss most? What would you fight to keep? We're checking another one off our Kids Summer Bucket List... this time it's bubbles! What have you been checking off on your bucket lists for the Summer? I'd love to hear your stories or feature your pictures! It's Back to School shopping time! Did you take a double take at that? Give you a panic attack? I bet you at least took a double take, but trust me, you'll be happy you kept reading! 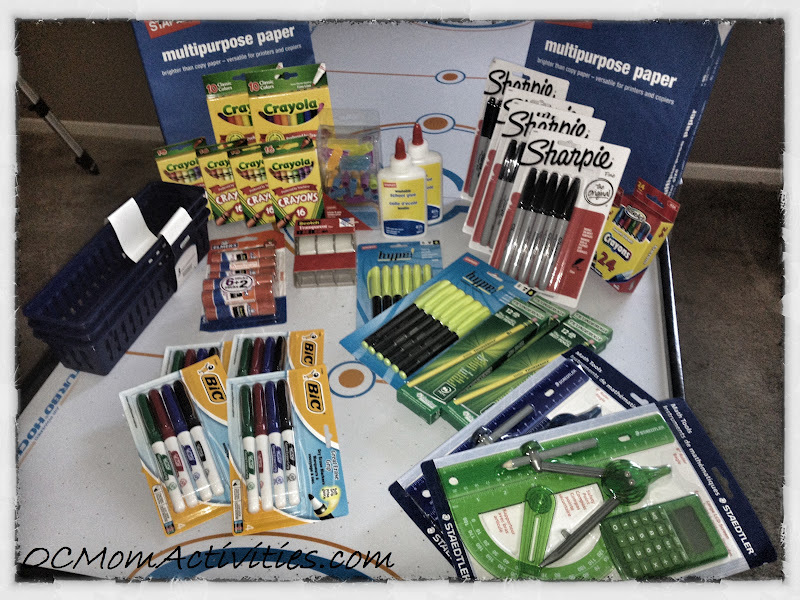 I know school just ended for lots of families, but as I was flipping through the fliers in the Sunday newspaper last weekend, I saw something that caught my eye - crazy, crazy deals on Back to School supplies at Staples! My jaw hit the ground as I skimmed through the flier and couldn't get down to our local Staples fast enough! When my oldest first started school I was completely shocked at how the school supply lists had changed since I was a kid. No longer were teachers asking parents to get the things their kids would individually need, they were asking for classroom supplies like white board markers, hand sanitizers and more. Every year I feel like it's a mad dash to find everything and organize the bags for each of the boys. The teachers always ask for slightly different things so it becomes a challenge just to get each bag put together correctly, my brain always ends up hurting. Then there is the common mid year request for more paper, pencils, sharpies and more. It really adds up and I find myself so focused on just finding the items that I don't have the chance to even think about the best deal. So this year I feel like I'm armed for battle. I'm stocked on Sharpies, white board markers, Ticonderoga pencils, glue sticks and more and all for a fraction of what I have paid in past years. I just got home and check out what I got for $52! Yes, you read that right... all of the supplies in the picture came to a total of $52 for 33 items of supplies. Actually, my total was $64 (there is a $12 mail in rebate on the multi-purpose paper and I bought one of the $10 savings passes). The savings pass cost me $1 after the 15% discount it gave me on my entire shop and will continue to provide me with savings through mid-September. 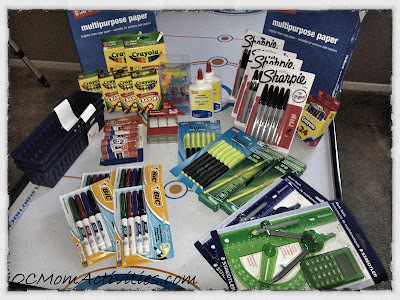 With reams of paper at .25 cents each, packs of Sharpies at $1 each, Roseart crayons at 1 cent each, I feel like a bandit! I think the sale runs through the end of this week - no coupons needed. I didn't have the school supply list from the boys classes, so I just decided to stock up on things that are pretty standard requests. Bring it, school year...but after another month and a half more of Summer vacation! Note: There was zero compensation for this post and it was totally un-pitched from Staples, I'm just sharing the great deals I found!!! Finding healthy desserts that will wow a crowd can be tough, especially when you have kids in the mix. My kids are flavor snobs when it comes to dessert - they stick to their favorites. I can't blame them as I'm a big fan of mint chip ice cream and cookies & cream ice cream too. I recently had the chance to head down to my local Walmart and purchase TCBY frozen novelties treats. Frozen yogurt has changed, it's no longer the bland, healthy option. You can now find your favorite childhood favorites with a healthy twist! I was floored by the choices and found myself wanting to buy one of everything! You can follow along on the shopping trip with pictures here. I stocked up on frozen yogurt sandwiches (my husbands favorite), mint chocolate chip frozen yogurt, strawberry swirl and cookies & cream. Being low in calories, low in fat and full of the probiotics that are so healthy in yogurt - it's a great way to get your dessert cravings in! For the 4th of July we had a small barbecue celebration with family and friends. The plan was to have a quiet evening by the fire pit, but instead we were pleasantly surprised to have a number of large firework displays we could see right from our backyard! I have to admit I was most excited for my dessert creation. It was super easy to make and was so delicious! Everyone loved it! It's super simple to create, here's how! Use nine frozen blueberries and line them up in three rows of three. Carefully take three TCBY frozen yogurt scoops (I used cookies & cream) and line them up around the blueberries in an L shape. Drizzle a red berry preserve (I used cherry preserves) in several lines over the frozen yogurt scoops to represent the lines on the flag. Then sprinkle with edible gold stars (you can find these where cake supplies are sold). Want to know to know more about the TCBY frozen novelty items? You can go here, or Twitter here, Facebook here, on Pinterest here. Don't miss a super fun Twitter chat ~> #TCBYGrocery Twitter Party on Thursday, July 26, 2012 from 1:00 PM - 2:00 PM EST (10 am Pacific) there will be fun discussions about TCBY and prizes! Note: I am a member of the Collective Bias™ Social Fabric® Community. This content has been compensated as part of a social shopper insights study for Collective Bias™ and TCBY #CBias #SocialFabric #TCBYGrocery as always, opinions are always 100% my own. Today is Mimi's Cafe Muffins or Miracle Day! If you're a fan of OCMomActivities on Facebook (if you aren't go here), you probably saw the super fun giveaway we did the other night for two Mimi's Cafe gift cards. I love Mimi's Cafe and one of the many reasons I do is Mimi's commitment to giving back through charities. This month Mimi's is working with the Children's Miracle Network Hospitals. 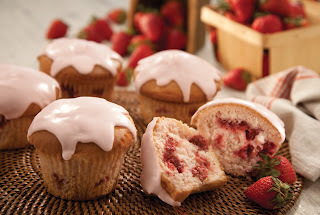 Today (Friday July 6th) everyone will get a free strawberry shortcake muffin with the purchase of their meal. 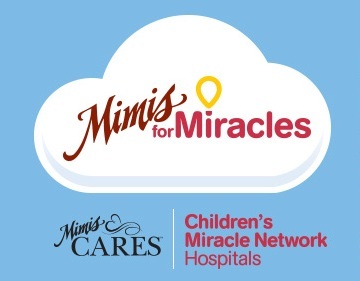 There are also great ways to get involved with the campaign for the Children's Miracle Network... From June 29 through the month of July, guests at Mimi’s Cafe restaurants can lend support by donating to Children’s Miracle Network Hospitals. With a $1 donation guests will receive a Miracle Balloon paper icon to display in the restaurant and with a $5 donation guests will also receive a balloon lapel pin. All proceeds will be donated to local CMN Hospitals. As a token of thanks, Mimi’s is providing up to $30 in coupon savings for those making donations. Kids can do their part by creating a Mimi’s for Miracles coloring sheet with a get well message that will be displayed in CMN Hospitals. When you are at Mimi's be sure to snap a picture holding on to the balloon and post it to the OCMomActivities fan page here! I'd love to see them! Have a wonderful, safe and relaxing 4th of July. Take a few minutes to step back and think about what you appreciate about this country. We have so much to be thankful for! It's that time of year! With so many bbq's and other entertaining to do, it's time to stock up on wine. Whether you are bringing a bottle for the hostess or are the hostess, one of the things I've learned is to always keep a few bottles on hand. Wine is something super easy to stock up on because it is so easy to store. Wine is such a great hostess gift, but can get expensive. Whenever BevMo does it's 5 cent sale, I am so excited because it basically means wine is 50% off! 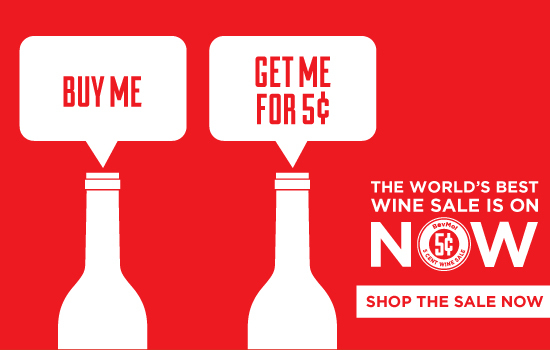 It's the perfect time to grab and stock up on wine! Yesterday I went and couldn't believe how much wine I got for $60. The employees are super helpful, they helped me find several new varieties to try so I could take best advantage of the 5 cent sale. I'm a wine novice (I love wine, but can't describe the flavors and by no means am a wine connoisseur! ), so the help was super appreciated! The 5 cent sale ends on July 9th, so RUN, don't walk to your local BevMo to stock up! 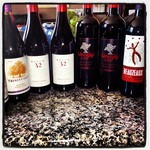 Not all wines are on the buy one, get one for 5 cents deal, but there are lots of great ones that are. Don't hesitate to ask for assistance if you are having trouble looking for the perfect wine. Don't know where your local BevMo is? Head here. Note: I received a gift card to facilitate the creation of this post, but note that it's a store I have shopped at for years and my opinions are totally unaffected. 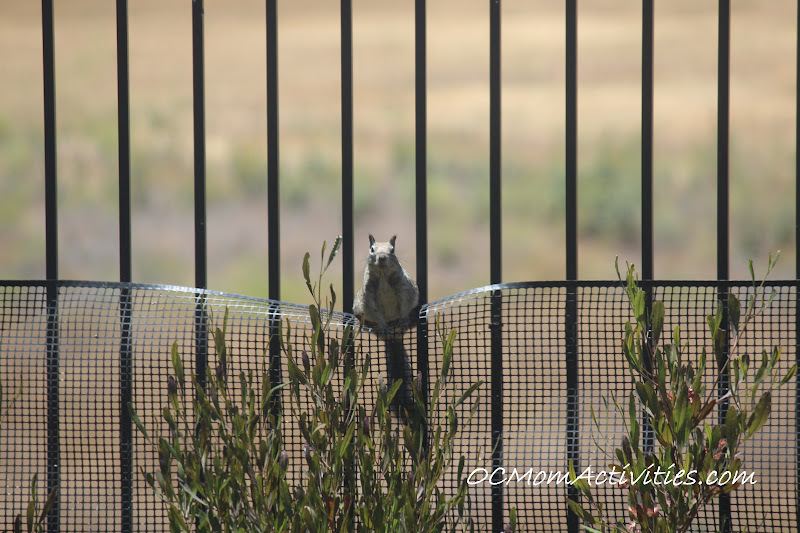 As always, the wildlife refuge we have apparently created in our yard has been active and we love that. Ok, most of the time. The other day I just knew something was not right. The birds were acting funny, so I lurked behind a window just watching. It didn't take long and then I saw it. I couldn't believe my eyes! 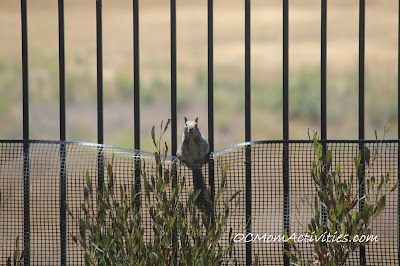 A squirrel had found its way in to our yard and was eating all the bird seed that had fallen to the ground. 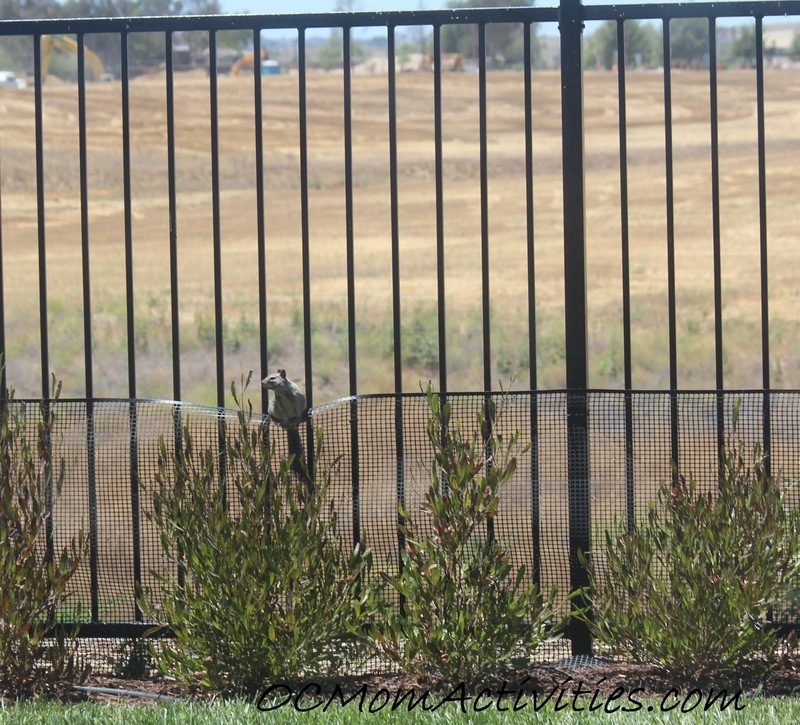 I'm sure you're wondering at this point why this nature excitement from my backyard is post worthy... you see, I knew no one would believe me unless I got a picture of it... We have a two foot tall plastic mesh barrier that goes around the yard to keep out the rattle snakes (reference this post for my nightmare). The little bugger squirrel is apparently a circus performer... I was waiting for him to pull out the balance bar and walk the tight rope! Have no fear, my kids have divided up nerf gun patrol for Summer break. A Christmas Story type scenario comes to mind. So help me out here... should I be worried about these squirrels in my yard? 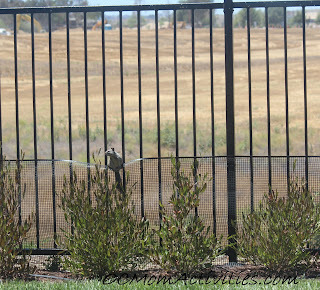 Are they going to be mischievious or a welcome addition of more wildlife?